Our unit in November 2002 moved to Devlali from our operational location (I assumed command in the operational location). After the unit settled down, as was customary, our Second-in-Command (2IC) requested me to take a round of the unit. We started with the office complex and headed straight of the Administrative Branch office. On the entrance, as with the case of the unit I had served earlier, the sign read “Out of Bounds for All Ranks”. I refused to enter the office as the Commanding Officer (CO) also was part of all ranks. I ordered the sign to be removed with the reason that the Administrative office is to ensure proper administration of all ranks and everyone has the right to visit and the right to entry. After visiting the other regimental institutions, we came back to the office complex and by then the sign at the entrance had been removed. On entering the office, there were about six clerks seated and a few Olive Green cupboards placed there to hold the documents. 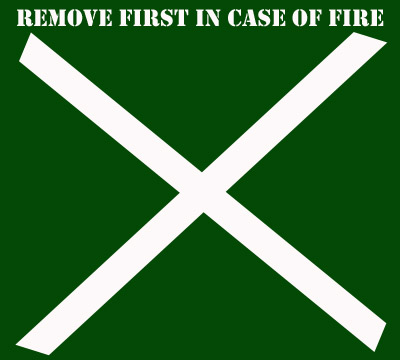 As usual, like most cupboards in all the army units, the front of the cupboard had a white cross with the stenciling on the top that read “Remove First in Case of Fire”. My query to the head clerk was as to which one I should remove first, as all the six cupboards had the same stenciling. The white cross mark indicates that the cupboard held Secret documents, where as all Secret documents are in the custody of the CO. All cupboards were ordered to be painted green, obliterating all the markings. That was when I realised that I had developed a penchant dislike for all the clerks, the mere sight of them put me off. I tried to reason out with all logic and compassion and tried to look deep in me for the development of such hatred. It all begun as a Second Lieutenant (2Lt) and when I joined our Regiment, our senior officers advised me to handle the clerks with a ‘kid-glove’. I could not fathom the reason as I thought everyone in the unit was a soldier and then a clerk or a gunner or a radio operator. It could have been because in those most officers like me were handicapped in that one had to depend on the clerks to produce any document type written on the Remington typewriters. As a junior officer when someone approached the clerks for assistance they always came out with the same excuse – The Battery Commander (BC) or CO had given him an urgent task and hence one had to wait. As the years passed by, I realised that the clerks were mostly the root cause of all the rumours that went around the unit discrediting the officers. Some even claimed that they were better qualified than their CO or BC as they were Masters (some even claimed they were double Masters [MAMA]) where as the officers were Graduates. Once I told off a clerk that in case he was worth even half the value of the paper on which his degrees were printed, he would not have joined the Army as a clerk. They were always a hindrance in the communication between officers and soldiers and some even charged commission for the work they did for the soldiers. Once as a BC – a Major in 1995, I had produced a Court of Inquiry (C of I) printed on the computer. The CO was not impressed with it as I had not submitted a manuscript copy. He called me to ask as to why I did not submit a manuscript copy as the C of I had to be in writing. I reasoned out with him using the definition of writing as per Indian laws which said making of any mark or impression is to be considered as writing. I further explained to him that in High Court and Supreme Court, the evidence is always type written by the steno as dictated by the judge. In this case I had typed it and all pages have been initialed by all members of the court and the witness whose statement had been recorded. Not being impressed by my justifications, the CO summoned the Head Clerk who ruled that in case all the pages were initialed, there was no need for a manuscript. The CO then asked me as to why the witnesses were not duly warned prior to making the statement. I said as C of I is not evidence, there is no need to warn as in the case of recording Summary of Evidence. That was when I remembered the case when a C of I was instituted to ascertain the circumstances under which I beat up a senior police official in Delhi when I was a 2Lt. I refused to be warned and as usual, the Presiding Officer of the C of I summoned his Head Clerk and I was really impressed by his ruling that officers are not warned and the warning applies to Other Ranks only. This ‘Blind Belief’ in the head-clerk and not trusting an officer upset me in both the occasions. Had the superior officers consulted the Head Clerk in my absence, I would not have felt so bad and would not have scarred my mind. On taking over the unit, I ordered the curtailment of the practice of addressing clerks as “Babu Ji”. The same applied to “Pundit ji”. Luckily we did not have a “Master Ji”. This could be carry forward from the uneducated cow belt of India. In Kerala, the babu is addressed as ‘Gumasthan’, pundit as ‘Poojari’ and master as ‘Aashan’. I ordered that the suffix of ‘Ji’ for all these VIPs be done away with. After the unit reached Devlali, due to the heavy commitment as in case of all cooperating units of School of Artillery, we were always short of manpower. It was ordered that all clerks will assemble with the unit at 7 AM and in case of any shortfall of manpower, the Regimental Havildar Major (RHM) could utilise the clerks, as the CO never gave then any tasks and they were all soldiers of the same status – Group Y. The RHM employed them for everything from assisting the chef at the kitchen to assisting the radar detachments. The RHM was the happiest as once he said that earlier when he went to the office, no clerk ever bothered for him. Even a recruit clerk would show him eyes and now he gets a VIP treatment as the clerks are scared that they would be teamed with the telephone line laying party. The line laying party is the first to set out on any outdoor exercise and the last to come back after reeling in all lines after the exercise.